Answer: You can definitely experience pareidolia while watching a random fireworks display, but as it turns out there is a way to force fireworks into specific shapes (within limits). First, let me say that this post may seem off-topic for Sky Lights, but fireworks does fall into the theme of “things you can see in the sky.” This question has been sitting in my “to answer” folder for several months, so when I noticed that this weeks publication date fell on the 4th of July I figured it was a good time to respond. I apologize for the delay. Sometime in the early 1990s pyrotechnicians began experimenting with what are now called pattern shells. Nobody knows who “invented” the idea — it was likely developed independently by more than one pyro (as they like to call themselves). The American Pyrotechnic Association (APA) has a glossary of fireworks that includes pattern shells along with all the other forms. You’ll see that all of the shapes are simple geometric forms. Making what is essentially an explosion assume any shape is as much science as it is art. But before I can explain how they do it, you need to understand how fireworks are constructed. Contrary to popular belief, the fireworks used for aerial displays do not have “rocket” form factors (some do, but most do not). Rather, they are spherical or cylindrical shells 5-100 cm (2–36″) in diameter. The shell is fired upward by an explosive charge in a mortar tube. The launch charge lights a fuse in the shell which is timed to detonate near the moment of maximum altitude. When the primary charge detonates, it propels smaller charges (called stars) outward more or less equally in all directions. These stars also ignite and, based on their chemical composition, provide the mix of colors desired in the main display. The result is the standard spherical pattern you see with most fireworks. But by incorporating cardboard baffles and barriers between the main charge and the stars, pyrotechnicians can preferentially send the stars in specific directions. By incorporating a timing delay in specific stars, you can get specific shapes. Many shapes are possible. Take a look at this Google Image search for “pattern shell fireworks.” You’ll also see a few images of the internal construction of pattern shells. Of course, there’s really no way to control the orientation of the pattern. 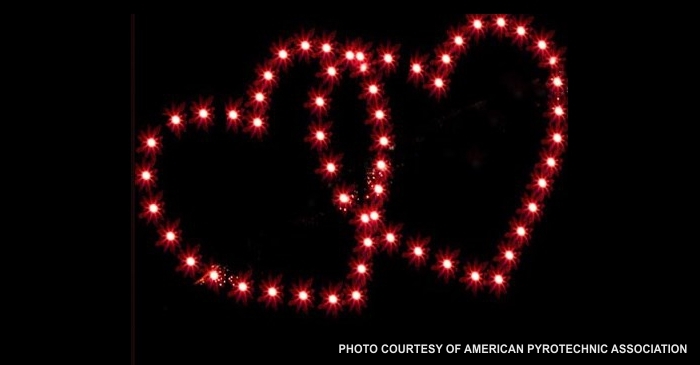 Some observers might see the “heart” shape while others might just see a vertical line of stars. So when pattern shells are part of the display, several are launched in unison to make sure at least one is oriented correctly. Enjoy your 4th of July! And if you attend a display be sure to bring some ear plugs.